Let’s Tell FOX That Books Matter! I have just launched Just Add Books – a campaign to include a books category in FOX-TV’s Teen Choice Awards. 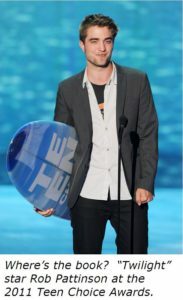 I started this campaign after looking at the recent TCA’s list of winners and finding no books among them. Movies, TV, sports, fashion, comedians; you name it, they were honored. No book award. Not one. How can this be? Books make kids smart. Countless studies on literacy show that reading is a crucial factor in teenagers’ academic achievement and future professional success. Today’s readers are tomorrow’s leaders, and to fail to recognize and promote books’ importance to teens in an enterprise as high-profile as the TCA is to do an entire generation a huge disservice. With the Teen Choice Awards, Fox has a unique and powerful opportunity to do good by its teen viewers by impressing upon them the importance of reading. By making books an awards category, Fox can generate for literature the same kind of excitement it sparks for music, film, and television. Would you help me in my effort to persuade Fox to add a books category to the Teen Choice Awards? I’ve written to Rupert Murdoch, the CEO of News Corp, Fox’s parent company, asking for his help in adding a books category to the TCA. I’ve written to every member of the News Corp board, NC’s Public Relations and Investor Relations and several FOX executives (see photo; those are the letters on my kitchen table). So far I’ve had no response. No acknowledgement. Not even a form letter. I think we can change that. Together. First, please visit our special Facebook group at www.facebook.com/justaddbooks and “like” it — then you’ll stay informed as the campaign unfolds. And please, please, please post your suggestions there on how to best get this done (I’m learning as I go, and I’d love some expert advice)! Soon, I’ll announce the date of Just Add Books’ Write to Rupert Day. On that day, I’m hoping you’ll send a letter to Rupert Murdoch asking him to to include books in the Teen Choice Awards. 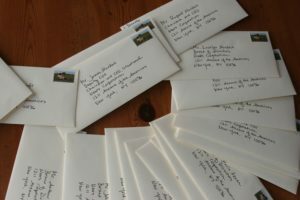 I’m also hoping you’ll tell your friends, your neighbors, your students, your book group, your local librarians, your senator, your teachers, your customers, your Facebook and Twitter pals, the cute guy at Starbucks, Justin Bieber, Taylor Swift, Tom Cruise (hey, you never know) to write, too, and to ask their friends to write. A sheet of paper, an envelope, a stamp, and half an hour of your time. That’s all it takes.